Spanish boatbuilder Astondoa has revealed more details about its 30.45 metre 100 Century yacht, which has been named Ninitas. First announced back in June and currently on display at the Cannes Yachting Festival 2017, this raised pilothouse yacht follows on from the Astondoa 110 Century yacht Sophye, which was launched in 2016 for a Brazilian client. 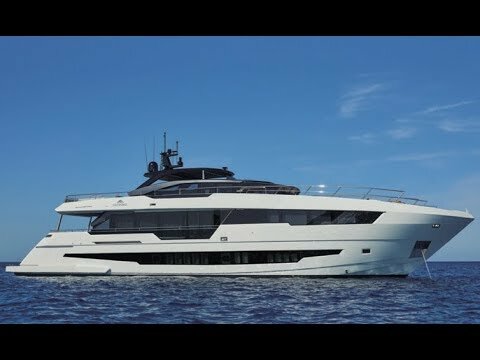 As the video below reveals, she boasts a multitude of al fresco relaxation spaces, including a large foredeck sunbathing area and a spa pool that has been fitted on the superyacht sundeck. Just like its larger sibling, Ninitas benefits from a notably elevated superyacht wheelhouse, leaving plenty of room for a full-beam owner’s cabin on the main deck. Further guest accommodation is provided in four cabins situated amidships on the lower deck, taking the total to ten guests, while the crew quarters allows for a staff of up to four people. Interior styling is courtesy of Italian designer Cristiano Gatto, who worked with the client to create “an extraordinary environment”, the yard adds. The saloon features plush sofas and freestanding armchairs, in keeping with a monochrome aesthetic, while subtly recessed lighting illuminates her cabins. Vital statistics include a beam of 6.9 metres and a maximum draught of 1.8 metres. Power comes from a pair of 2,185hp MTU 16V2000 M86 engines that should propel Ninitas to a comfortable cruising speed of 22 knots, topping out at 26 knots. 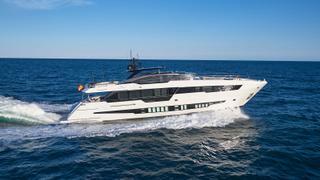 Astondoa also has plans to expand its Century range with a 36.5 metre model and a 40 metre model both currently on the drawing board.